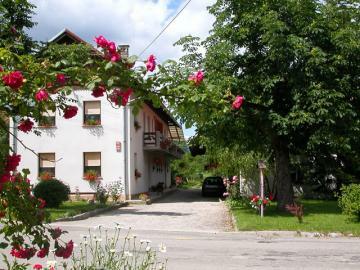 You can find the Logar Tourist Farm in the pleasant village of Žerovnica beside Cerknica Lake. Here you will be offered overnight accommodations in a neatly furnished Notranjska house (with an architectural award). Nearby is a house where you can refresh yourself with food prepared according to the standards of ecological farming. With advance notice they also offer one-day or weekend holidays and overnight stays with breakfast, lunch, or dinner. They also offer a vegetarian menu. You must not miss the “Days of Asparagus” in May, June is the “Month of Strawberries,” and in the autumn months the hosts prepare all kinds of autumn goodies. In addition, you can taste or buy homemade juices, jams, and dried fruits and stock up on apples for the winter. The near and distant surroundings are full of places of interest to visit: Križna jama Cave, Snežnik Castle, Rakov Škocjan Regional Park, Mount Slivnica, Cerknica Lake, and many more. You will get more information when you make your reservations and when you arrive. Activities in the area include skiing, cross-country skiing, horseback riding, swimming in river / lake, skating, bicycling, boating, windsurfing, paragliding, hang-gliding, bowling, hunting and fishing.